System.Net.Sockets.Socket Class provides the basic functionality of a socket application. Creates a new socket to handle the incoming connection request. Associates a socket with the local endpoint for listening to incoming connections. Forces the socket to close itself. Establishes a connection with the remote host. Returns the value of a SocketOption. Sets low-level operating modes for the socket. 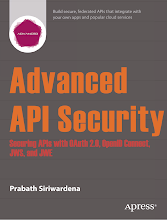 This method provides low-level access to the underlying socket instance of the Socket class. Places the socket in listening mode. This method is exclusive to server applications. Receives data from a connected socket. Determines the status of the socket. Checks the status of one or more sockets. Sends data to the connected socket. Disables send and receive on a socket. In blogger under "Design" tab click "Edit HTML". 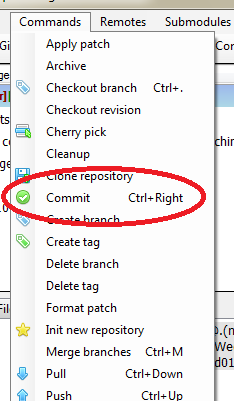 Copy following and paste it just before the </head> tag in the area under "Edit Template". 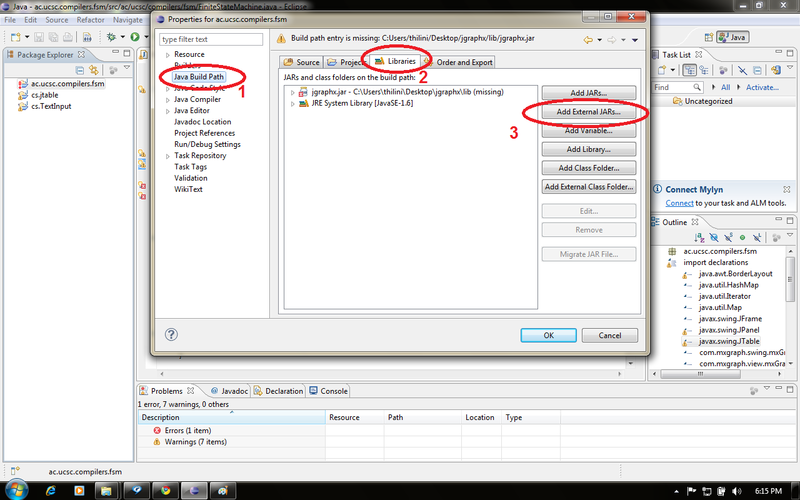 Copy following and paste it in the same area as in the second step but this time paste it just before the </body> tag. Goto http://syntaxhighlighter.googlecode.com/svn/trunk/Styles/SyntaxHighlighter.css and copy the entire stylesheet paste it in the same area as step one and two, but this time paste it just before ]]<. 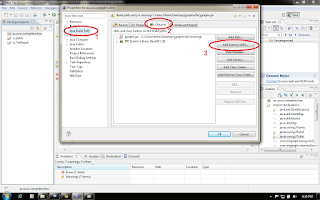 HTML Encode the source code using "HTML-encode a string". Composing a blog post inside the "Edit HTML" editor,when you encounter a place where it is required to add the code snippet copy the encoded source code and paste it in between following tags. Socket is one end of a two way communication link between two programs running on a network. Socket numbers are unique across the entire internet as IP address is unique across the internet and the port no is unique on the individual machine. This enables process to communicate with another process across network based entirely on socket number. C# codes can be compiled using "Visual Studio Command Prompt". 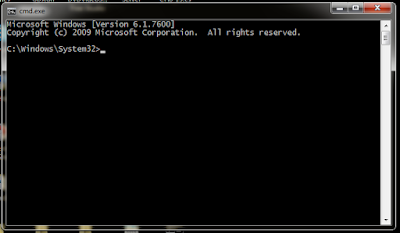 Most of the people facing difficulties when it comes to find this command prompt. It resides in "C:\Windows\System32" as cmd.exe. 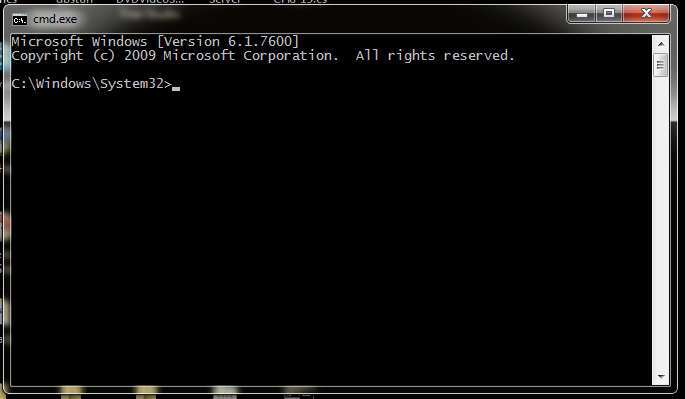 For windows7 users it is possible to search for it through the start menu typing "visual studio command prompt". • Version (Specifies the format of the IP packet header): 4 bits. • IHL, Internet Header Length (Specifies the length of the IP packet header in 32 bit words. 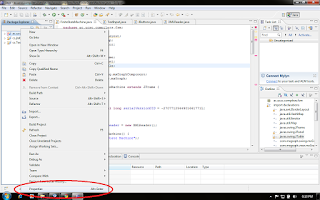 The minimum value for a valid header is 5): 4 bits. • Differentiated Services (This field is defined in RFC 2474 and obsoletes the TOS field): 8 bits. • Total length (Contains the length of the datagram). 16 bits. • Identification (Used to identify the fragments of one datagram from those of another. The originating protocol module of an internet datagram sets the identification field to a value that must be unique for that source-destination pair and protocol for the time the datagram will be active in the internet system. The originating protocol module of a complete datagram clears the MF bit to zero and the Fragment Offset field to zero): 16 bits. • Fragment Offset (Used to direct the reassembly of a fragmented datagram): 13 bits. • TTL, Time to Live (A timer field used to track the lifetime of the datagram. When the TTL field is decremented down to zero, the datagram is discarded): 8 bits. • Protocol (This field specifies the next encapsulated protocol): 8 bits. 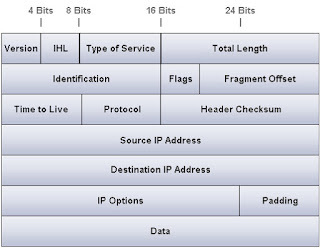 • Header checksum (A 16 bit one's complement checksum of the IP header and IP options): 16 bits. • Source IP address (IP address of the sender): 32 bits. • Destination IP address (IP address of the intended receiver): 32 bits. 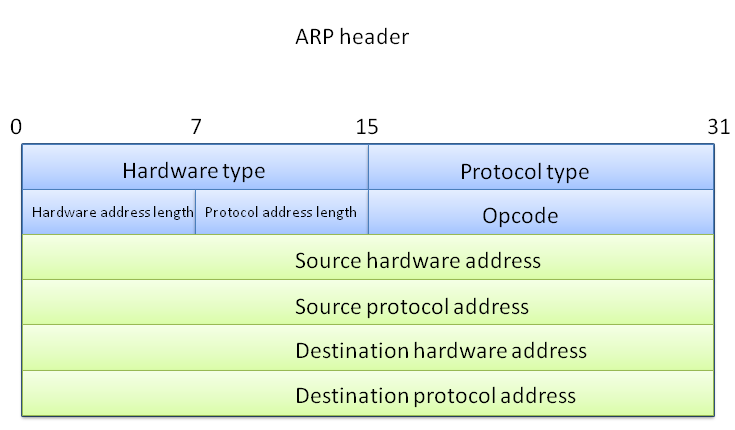 ARP (address resolution protocol) is used to translate protocol addresses to hardware interface addresses(mac). • Hardware type: 16 bits. • Protocol type: 16 bits. • Hardware address length (Length of the hardware address in bytes. ): 8 bits. 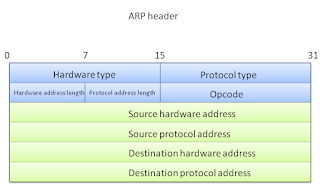 • Protocol address length (Length of the protocol address in bytes. ): 8 bits. • Source hardware address: Variable length. • Source protocol (mac) address: Variable length. • Destination hardware (mac) address. : Variable length. • Destination protocol address: Variable length. Consider the lex program given below (line.l) which adds line numbers in front of each line in a given text file and displays the output on standard output. yytext : The text of the matched pattern is stored in this variable. yytext is a char pointer. yyin : Of the type FILE*. This points to the current file being parsed by the lexer. yylex() : The function that starts the analysis. It is automatically generated by Lex. What if there is no matching pattern to be found? Any string matches and default action happens which means all the inputs are going to be printed in a way one at a time. For this program it requires a a file as a command line argument. So a file should be provided in this stage. 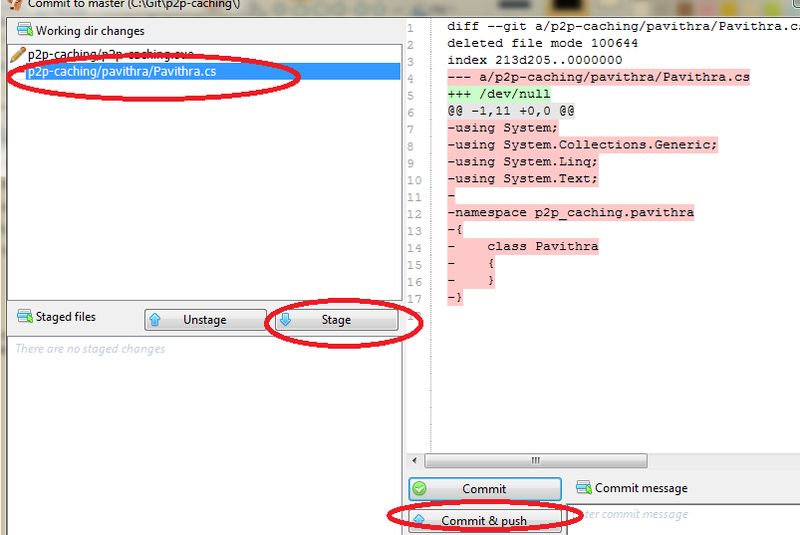 If it is needed to print the output in a file, just redirect the output to a text file like following. 1. 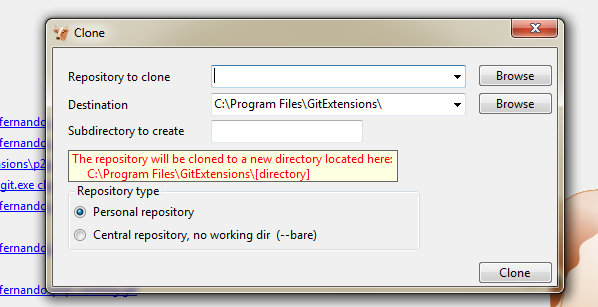 Inside the "package explorer", Right click on the project which needs to add the external jar file and click on "properties". 2. 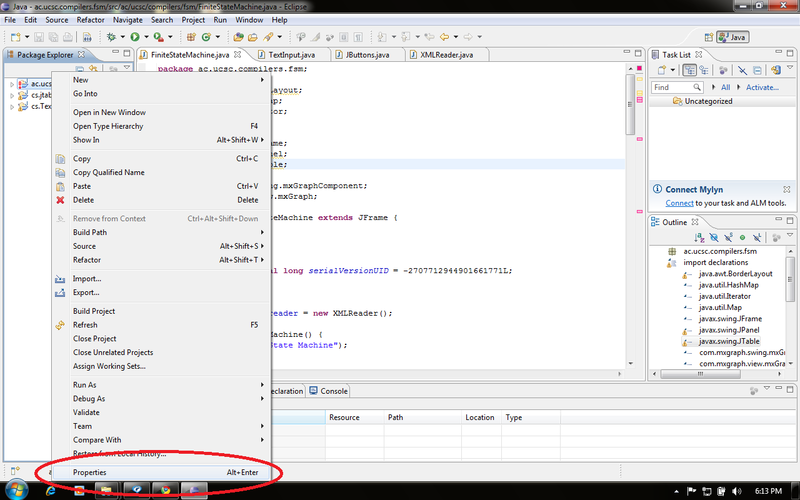 In "java build path", inside "Libraries" tab choose the external jar file by clicking on "Add external JARs" button and click "OK". 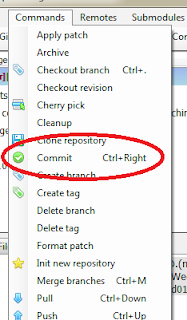 After finishing installations, Open git bash program and type the following command there (skip pass phrasing by entering). This process will generate a key. 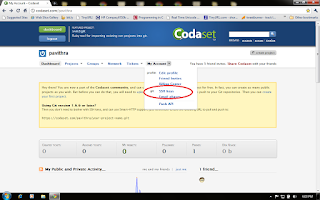 Upload the key to codaset using the following way. 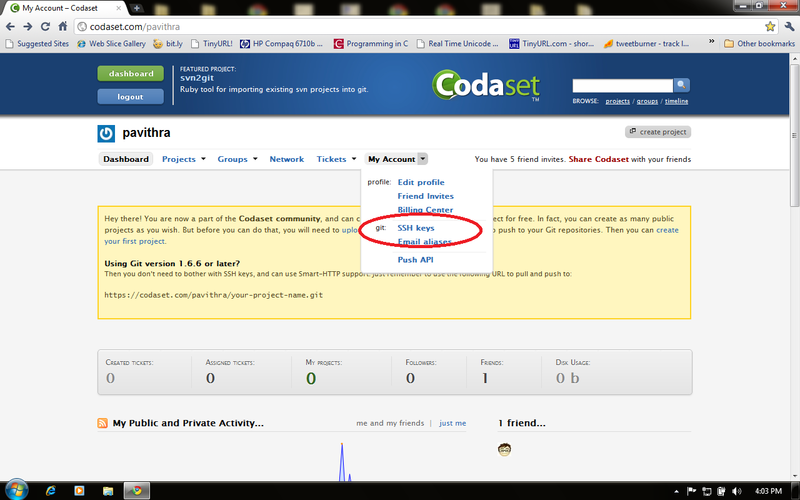 Myaccount > SSH keys then click on "upload new"
Do the wanted changes to the project , go to the Git extensions again and open the repository been working on, under the command menu click on commit, stage the wanted files and click on "commit and push" to update in codaset so changes will be visible to everyone.